Chase, chase and chase some more, no wonder teams tire so quickly when up against Manchester City. Devoid of any meaningful time with the ball, on this occasion, Wolverhampton Wanderers simply spent much of a cold Mancunian evening shadowing their 11 opponents. From start to finish there was no choice. This was a different game to the ferocious battle against Liverpool some 11 days ago, and also the emphatic triumphs against Rotherham United and Burton Albion in both domestic cup competitions. Rather this was the beating that many Premier League sides have endured in recent months, death by one thousand passes. Forwards, backwards, inwards, outwards, under, over, City manoeuvred their way to victory in this match with their passing. At times it felt like one could count the amount of touches of the ball that Wolves had on one hand. 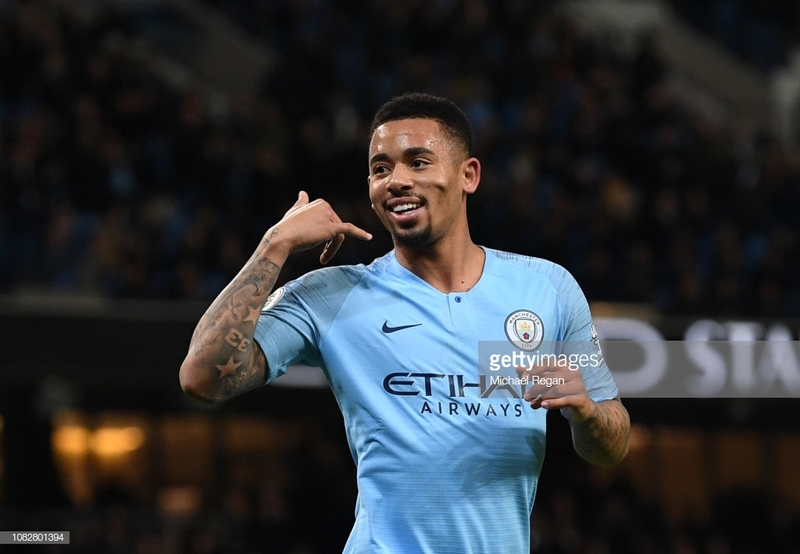 It didn’t help that they were one goal down after 10 minutes following Aymeric Laporte’s killer pass, a Leroy Sane pull-back and a Gabriel Jesus finish into the net. Nor that they were a man down a mere nine minutes later. Irrespective of early goals and sending offs, it felt like the outcome would have been the same nevertheless. This had the potential to be a tricky assignment with Wolves showing that they have the taste for an upset when up against one of the bigger teams. The fact that they became the first team this season in the Premier League to receive a red card, concede a penalty and score an own goal was more a testament to City than anything else. Wolves were reduced to little more than partakers in the City show to stay in touch with Liverpool. The gap reduced back down to four points with Jurgen Klopp’s side also winning this weekend against Brighton. Liverpool are asking the questions and City are having to answer them, but do so with more confidence as each match passes. The only thing that this City performance lacked was more goals. They only managed one in the second half – a Conor Coady deflection from a Kevin De Bruyne shot – despite seeing more than enough of the ball. City were comfortable and in control; there was little need to exert themselves much more following a gruelling run of fixtures. Although the goal difference cannot be neglected, such is the who’ll blink first, nature of the title race. Jesus fully justified Pep Guardiola’s decision to keep him in the starting lineup; scoring twice and leading the line with renewed energy. Ederson was so unoccupied with goalkeeping duties that he took it upon himself to adopt a midfield position and the manner in which he stroked the passed around was both amusing and disconcerting. Wolves were unable to get close to the City goal and barring a late corner kick won on the cusp of stoppage time, their travelling supporters would have needed binoculars to get sight of them such was the camped position down the other end. But that is how City get teams; Wolves are perfectly capable at playing good football but here they starved of oxygen as well as the ball. Raul Gimenez struggled up front and his replacement Adama Traore hardly fared any better. City were by and large coasting. A collection of short and long range passes instigated mainly by Fernandinho flanked by Bernardo Silva and David Silva, spun Wolves into a web. There was the odd display of frustration from the visitors – Willy Boly’s studs-high challenge on Bernardo Silva being one of them, which in days gone by might have been seen as a fair tackle but nowadays leaves little defence. What City do so well is the crescendo that begins with rather slow short passes and builds to quicker passes around the penalty area and then the impending finish. Their first goal here was in many ways trademark City; the pull-back that Sane played to Jesus is almost tradition now and, although much easier said than done, opponents must try to deal more coherently with it. It is the slickness with which City move the ball that is so striking, each player barely comes up for breath when playing the quick one-twos and incisive threaded balls. They barely got out of third gear here but still were able to dictate and control with ease. There was an element of luck too. Did Ryan Bennett make enough contact on Raheem Sterling to warrant a penalty? Sterling was travelling at speed and invited Bennett to make the challenge but it was a clumsy effort which cannot be said of Jesus’s subsequent spot-kick. Wolves were happy to simply limit the damage whilst City after the break – unlike recent matches – were content with the tally they had amassed and simply passed the ball around for fun. It was an evening of many positives for Guardiola and also for David Silva who became the City’s highest appearance-maker in the Premier League era, overtaking Joe Hart on 266. This was not Silva’s best game, if truth be told, but it didn’t need to be. When one side has so much of the ball with little threat or resistance from the opponent then there is only so much that can go wrong. For City and their one thousand passes, it brought about another three points and an evening of comfort and control.